Time-based metrics are of considerable interest to online publishers. There seems little doubt that “attention minutes,” in one form or another, will be a tool used by both marketers and media. DCN has identified many of these possibilities. But it’s far from clear whether these metrics will, or should, displace more conventional measures of audience size. To consider the strengths and weaknesses of time-based metrics as currencies, we explored the relationship between the time people spend with websites and the popularity of those sites. Do attention and popularity measure different things? There is a long-standing law of consumer behavior called “Double Jeopardy” (DJ). It stipulates that popular offerings enjoy more consumer loyalty than unpopular offerings. DJ in television has meant that channels with high ratings have higher levels of time spent and repeat viewing. The only meaningful exception has been the “small-but-loyal” audiences of foreign language channels. So on the web, it’s possible that the most popular sites (as measured by UVs) also rack up the most attention minutes. If popularity and time spent are highly correlated, either metric would produce the same winners and losers. To see if that’s true, we used comScore data to test the correlations among several metrics. 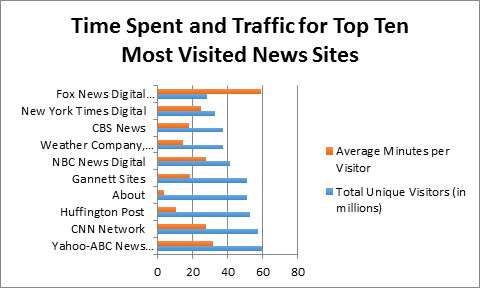 We looked at three-month aggregates from October to December 2014 across 1,067 news sites. The time-spent measures, which included “average minutes per visit,” “average minutes per page,” and “average minutes per visitor,” were highly correlated. However, there were only weak correlations between time spent and audience size. You can get a sense of this in the chart below. Most outlets with small-but-loyal audiences were, like TV, non-English sites. So there were no DJ effects. More importantly, it seems that time-based metrics are tapping into something quite different from popularity. So which is better suited to be a currency? What do attention minutes tell us about content? DCN and several others have suggested that attention minutes might be a good measure of audience engagement and quality. As such, attention minutes could be useful for developing content – which, in turn, could build audience loyalty. But currencies typically reflect the needs of advertisers. Do time-based metrics offer advertisers something of value that they can’t get from measures of popularity? At a minimum, attention minutes can help authenticate exposure to an ad, serving as an extension of viewability standards. Beyond that, it’s harder to see why an advertiser would put a premium on the audiences’ engagement with a publisher’s content. One possibility is that an ad becomes more effective when it’s surrounded by content that has truly engaged readers. But here, the evidence is mixed. There’s some indication that the benefits of engagement in content bleed over to advertising. For example, a 2012 comScore report concluded that content engagement is more strongly correlated with advertising effectiveness than clicks or total impressions. Additionally, a 2009 experiment found that user engagement and advertising effectiveness are positively associated. On the other hand, consistent definitions of engagement are elusive. What’s more, a 2013 Nielsen report suggests that it’s the medium, rather than the content, that most greatly affects advertising efficacy. If advertisers are convinced that engaging content benefits their ads, premium publishers might be able to profit from that association. But programmatic buying is gaining ground in online advertising, and that potentially divorces ad placement from its surrounding content (though the number of private marketplaces is growing). Some advertisers don’t care about content apart from its ability to deliver the attention of prospective customers. It’s the characteristics of the people being delivered that are likely to matter most for any currency. What do attention minutes tell us about visitors? Advertisers typically use metrics to describe and target audiences. Historically that’s been age and gender, but with all the digital exhaust users leave behind, it now seems the sky’s the limit. You could identify those users who are engaged by time spent measures, then add them to the targeting mix. But it could backfire. Our findings indicated that individuals who spent large amounts of time on news sites tended to be heavy web users. In other words, they spend a lot of time online. In a world that’s driven by programmatic buying, the heaviest users are the easiest for advertisers to reach. The laws of supply demand suggest they’ll be of less value to advertisers. And this just might turn the A in attention minutes into a scarlet letter. James G. Webster is a professor of Communication Studies at Northwestern University. He’s the author of The Marketplace of Attention and Ratings Analysis: Audience Measurement and Analytics. Jacob L. Nelson is a doctoral student in Northwestern University’s Media, Technology, and Society program. A former journalist, his research looks at news consumption and media metrics.